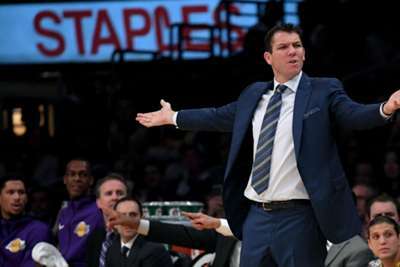 Luke Walton admitted his Los Angeles Lakers team looked tired as their poor start to the season stretched to 4-6 with defeat to the Toronto Raptors. Lakers head coach Walton has come under increasing pressure in recent days with Los Angeles failing to perform as many had hoped with the offseason arrival of LeBron James. Team president Magic Johnson reportedly visited Walton last week to address the Lakers' form, but the three-time NBA MVP insisted before Sunday's game: "[Walton] is going to finish the season - unless something drastic happens, which it won't." There was no improvement against the Raptors, though, as a dismal first quarter in which Toronto scored 42 points contributed to a 121-107 away win at Staples Center. Walton, like his team, was blown away by the Raptors and left searching for reasons for the latest loss. "I'll start by giving Toronto credit. That's a good team and, boy, were they ready," he told a news conference. "I don't know if we were tired from our game last night [Saturday's win against the Portland Trail Blazers] - not that that's an excuse - but it felt like that in the first quarter. "They jumped all over us, they got where they wanted to, they got in a rhythm. It made it tough to stop after that. "I was proud of our guys for continuing to fight - not that it matters - they competed throughout the whole game. That deficit we built in the first was just too much to overcome." He added: "It's the NBA; you're going to have nights where other teams are hot and you just can't find it. You don't want nights like that, but they happen." The Raptors were without star man Kawhi Leonard due to a late injury, but Walton felt that worked against the Lakers. "I've played in a lot of these games. I know what it's like to think, 'OK, this game just got a lot easier'," he said. "In my experience, unfortunately, when a player like Kawhi sits out, that team ends up winning. We tried to explain that that's how this works, but it doesn't seem like we took that to heart."